When divorcing, you have three options when it comes to deciding what to do with your house. 1. Sell the house and split the proceeds. 2. One spouse stays and buys the other out. 3. Keep the house jointly. This is without a doubt the easiest and cleanest way to split what may be your biggest asset. However, it may not be ideal if you want to keep your kids in the home. If you decide to sell your home, a tip that I would give you is to come up with a plan before you put your home on the market if your house doesn’t sell right away. Agree with your spouse in advance to scheduled price drops. You have enough decisions to make right now. Deciding your selling plan advance can avoid further disagreements. Consult with your REALTOR on a price drop strategy. If one spouse is keeping the home and buying the other out, the first thing you need to do is come up with a value of your home. You have two choices to do this. You can hire an appraiser or use a REALTOR. Hiring an appraiser will cost you money. You can expect to pay anywhere from $500 to $1000 to hire an appraiser. Most REALTORS, however, will do a valuation on your home for free in hopes of earning your business in the future. My advice is that both spouses choose their own REALTOR do a valuation of the home. Agree to take the two valuations and use the average of the two to come up with the value. Using two REALTORS avoids further fighting that the REALTOR’s valuation is bias to one of the spouses. Keep in mind that if you and your spouse cannot agree on a value for your home and you end up in court, the judge may require you to hire an appraiser. Once you have agreed on the value of your home, you can come up with a buyout amount. Typically this is value minus current mortgage, divided by two. If there are enough other owned assets to offset the buyout amount, the spouse who is leaving the home can be awarded other assets to make up the difference. But if there are not enough assets then the spouse who is staying may have no other choice but to refinance the home and buy the other spouse out with cash. However, even if there are enough assets to offset the buyout, always refinance! I’ll say it again ALWAYS REFINANCE! It is so important that the spouse staying in the home refinance the home and take the leaving spouse off the mortgage. First of all, even if the divorce decree says that one spouse is staying in the home and is responsible to make the mortgage payments, the mortgage company doesn’t quite see it that way. They have an agreement from both of you to make the payment and they will still hold both parties responsible for making the mortgage payment. This means that if you are the person leaving the home and your spouse misses a payment, it affects your credit as well. Also, if you are the leaving spouse, you may have problems getting a loan when you want to purchase a home because your name is on another mortgage which may make your debt to income ratio too high to qualify for a new loan. When one spouse is keeping the house ALWAYS put a time limit on the amount of time the staying spouse has to refinance and buy the other spouse out. Usually a good amount of time is about 15 months after the divorce is final. This is a fair amount of time because often a mortgage company wants to see how a person’s financial situation fairs after a divorce and they would like to see about a year’s worth of proof. For example, let’s say that a wife is keeping the home, she has been a stay at home mom and doesn’t work but she has been awarded $5000 per month in alimony. Most mortgage companies are not satisfied that the wife was awarded $5000 in alimony, they want to see the proof that the ex husband is going to pay the alimony. So many lenders will only lend based on that alimony income only after the payments have been successfully made for a years time. If the refinance time limit is not met, have an agreement set in place that the house will be sold at that time. Things to consider if you want to keep the house. If you are the one who wants to keep the house, make sure that you really do want to keep it. Because if you change your mind a couple years from now, it could cost you tens of thousands of dollars more. If you sell your home now you and your spouse will be splitting the selling costs which includes REALTOR fees and closing cost. If you keep your home and decide in a couple years that staying was not the right decision, then you will be taking on those costs yourself instead of splitting them with your spouse. Also, if you have lived in your home for a long time and/or have made a significant amount of gains, you need to consider the taxes. The IRS allows a $250,000 exclusion for singles and a $500,000 exclusion for couples on gains made on the sale of a home that they have lived in for at least two of the last five years. So, let’s say that you have made $300,000 of gains on your home. If you sell that home with your spouse, you will owe no taxes on those gains. However, let’s say you keep the home but sell in a couple years. If you sold the home on your own with those $300,000 in gains, you will owe taxes on $50,000 worth of gains because you can only take the $250,000 exclusion. There are several reasons that couples decided to keep a house jointly after they have divorced. Sometimes both spouses agree that it is important to keep the kids in the home but the staying spouse is unable to refinance. So the spouse who is leaving agrees to stay on the mortgage in order to keep the kids in the home. This is fine, but if you are the spouse who is leaving just be mindful of how this may effect you as I stated above. Sometimes couples keep a home jointly as an investment property. Other times, couples keep the house jointly because they are upside down in their mortgage and are unable to sell at the time of divorce. And sometimes couples keep the home because they have agreed to a birds nest living situation. This is where the kids stay in the home and the two spouses move in and out when it is there time with the children. This is a unique situation and usually temporary. Whatever your reason is for keeping a home with your spouse, be sure to put a time limit on how long you will keep the house. Put in place a date when you both agree to sell the home. For example, if you are keeping the house for the kids, then agree that you will sell the home in June of the year that your youngest graduates high school. If you are both in agreement you can extend this time at a later date. 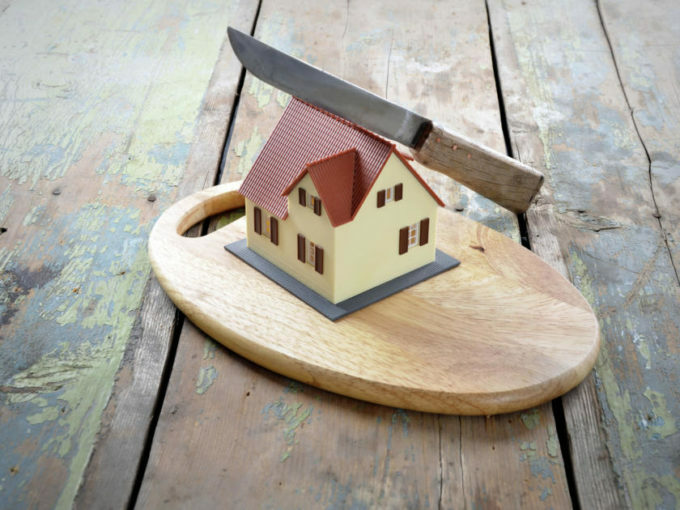 But with no date set in place, there is no protection in place for either spouse for when the home will be sold which could end you up back in court. Whatever you decide to do, be sure to protect yourself! Think about the future and try your best to plan ahead! If you live in the Denver area and need further advice, feel free to contact me at 720-476-0370. I have been certified as a Real Estate Divorce Specialist and would be happy to help you figure out what’s best for you!